When my husband and I were vacationing in Paris, one of the things I had on my “must do” list was visiting the Chapel of Our Lady of the Miraculous Medal, where the incorrupt body of St. Catherine Labouré rests. It was one of our first days in Paris when we ventured out to find the chapel, and it was rainy. It wasn’t just a light mist; it was the sort of rain that washes clean the canvas of one’s outward appearance in mere seconds. Despite my umbrella, my little skirt, ballerina flats, and neatly done hair were all a shambles minutes after we exited the Metro. Drenched and chilled, we started our journey armed with our map app and ample time before Mass was to begin. About two hours and at least 10 misdirected turns later, we arrived at the chapel moments before Mass, drenched, cold, sniffling, and generally miserable, having forfeited lunch in the hopes of reaching our destination on time. Pope Francis recently spoke of pilgrimages and how often the pilgrim reaches a sanctuary feeling tired, hungry, and thirsty, and how those physical conditions often reflect the inner condition. Thinking back to that moment we entered the Chapel of Our Lady of the Miraculous Medal, yes, we were indeed tired, wet, and hungry (and admittedly a tad cranky) when we finally reached our destination. We found a pew amongst the sizeable crowd gathered, and I began to take it all in. I observed all of the people of so many races and ethnicities, who had all found their way to the shrine that day. Clearly, there were pilgrims here from all around the world. Then Mass began, and despite all of our diverse backgrounds and varied paths, we celebrated together. We prayed the Our Father in our own languages but still as one. My husband and I had only managed to find a pew near the back and I could not see much at all, but it was still one of the most beautiful Masses I have ever attended. We were together, we had reached our pilgrimage destination, and we were all welcome. It felt as though, in that pilgrim’s welcome, the trials of our journey were washed clean with the rain. How like the experience of a pilgrim journeying to a shrine is the experience of Lent! While we all have our own journeys with varied adventures along the way, we are all journeying towards our Easter destination—that glorious day when we come together to celebrate our Lord’s triumph over death. We may arrive tired from the trials of our Lenten journey, hungry from our sacrifices, or frustrated about that which we had lost along the way. But as we all arrive at our Easter destination together, we are welcomed among our fellow pilgrims, and together we are washed clean and renewed. Image by Jean-Louis Zimmermann under CC BY 2.0. 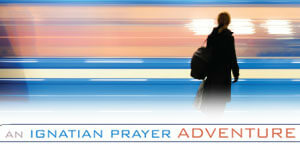 We are all on a pilgrimage on God’s Holy Ground and journeying in God’s Time.